The U.S.-backed Afghan government has lost control of more than one-third of Afghanistan, reveals an American watchdog agency appointed by Congress, citing U.S. Forces in Afghanistan (USFOR-A). Specifically, the government no longer controls 140 districts out of a total of 407 within 34 provinces across the war-ravaged nation. According to the latest quarterly report to Congress by the Special Inspector General for Afghanistan Reconstruction (SIGAR), the watchdog agency, the Afghan government has lost 19 provinces since January 2016. The government’s loss in territory comes amid an “exceptionally active” Taliban campaign and operations by the Islamic State (ISIS/ISIL) branch in the country (ISIL-K/IS-KP). The U.S. has increased its military presence in the country to combat ISIL-K, which launched the deadliest attack in the Afghan capital of Kabul since the war started nearly 15 years ago, killing 80 and wounding 231 last weekend. 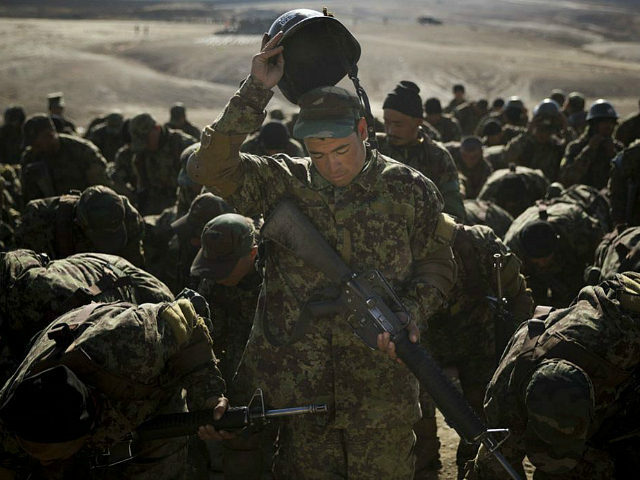 SIGAR’s 245 page report reveals that the overall number of American troops increased by 350, from 8,850 as of the end of February to about 9,200 as of May 31, 2016, despite President Barack Obama declaring an end to the combat mission. He plans to maintain about 8,700 troops into 2017. USFOR-A reports that approximately 65.6% of the country’s districts are under Afghan government control or influence as of May 28, 2016, a [nearly 7 percent] decrease from the 70.5% reported as of January 29, 2016. Of the 36 districts under insurgent control or influence, nine districts with a population of 524,072 are under insurgent control and 27 districts with a population of 1.98 million are under insurgent influence. According to USFOR-A, the [U.S./NATO] mission determines district status by assessing five indicators of stability: governance, security, infrastructure, economy, and communications. The figures show that more than 34 percent of the country is either under the control/influence of terrorists or at risk of being so. SIGAR points out that the Afghan National Defense and Security Forces (ANDSF) continue to face capability gaps and remain unable to fully operate independent of U.S. military assistance, despite nearly $70 billion in American taxpayer funds invested to develop the force and years of U.S. training. The Taliban have been exceptionally active in 2016, particularly after launching their annual spring offensive. Many of the issues preventing the ANDSF from properly engaging the Taliban relate to deficiencies in key areas such as command and control, leadership, logistics, and overall coordination. High attrition rates, including high casualty rates, continue to make the sustainability of the ANDSF a major concern and priority for leadership. USFOR-A reports ANDSF performance … is uneven. The ANDSF requires Coalition support to effectively incorporate capabilities. Historically, the Afghan Taliban has more territory and fighters than any other terrorist group in Afghanistan. The U.S. State Department deemed the group the most prolific terrorist organization in the world in 2015. Security instability in Afghanistan is reportedly concentrated along the country’s border with Pakistan, which U.S. and Afghan officials have accused of providing sanctuary to terrorists. The ISIL-K stronghold in Afghanistan is located int the eastern province of Nangarhar along the Pakistan border. Traditional Taliban strongholds, including the poppy-rich Helmand and Kandahar provinces, are also located along the international boundary between Afghanistan and Pakistan. The ANDSF have struggled to respond to the Taliban’s growing national presence. There has been particularly stiff resistance in provinces along the border with Pakistan, such as Helmand, Kandahar, and Nangarhar, with reports that 68.5% of security incidents occur in southern, southeastern, and eastern Afghanistan.